3 lb. 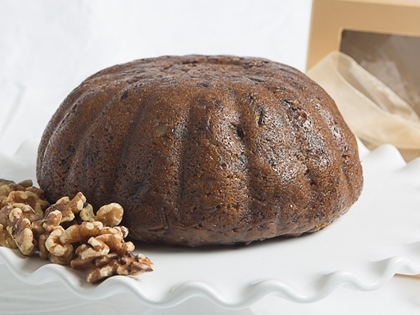 Deluxe Walnut Fall Harvest Plum Pudding - made with a pumpkin base, dark raisins, walnuts, rum and brandy. This Deluxe Walnut Fall Harvest Plum Pudding is made with a pumpkin base, dark raisins, walnuts, and an added touch of rum and brandy. This item continues to be a favorite with our customers. Packaged in a gold box with a gold ribbon and gift card, this 3 lb. pudding serves up to 12 people. My pledge to you as a valued customer: If for any reason you're not satisfied with the product, return it within 30 days of your requested shipping date and we will replace it or refund your money. Follow Gifts of Taste by Adreanne's board Holiday Favorite Gourmet Desserts on Pinterest.